Anybody can blow up the Earth, but it takes a select bunch to blow it up in style. The developers of Rage, id Software, are taking a slight gamble when it comes to the style and setting of its upcoming title. 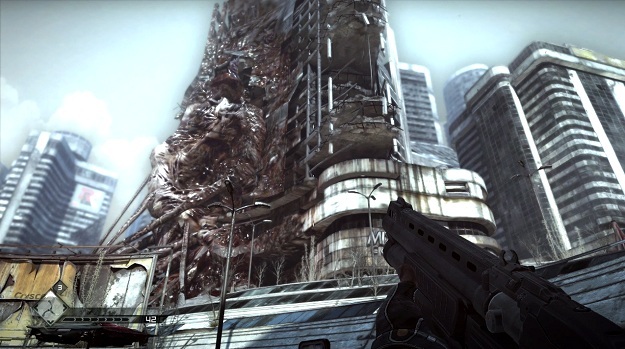 The game will be a first-person shooter set in a post-apocalyptic Earth–and if that sounds familiar, it is because there are several other games with a similar description. The genre is crowded, so to rise above the competitors id will need a game that offers something fresh. Thankfully the developer has a strong track record and has proven again and again that they are one of the best FPS developers working today. After all, id did sort of create the modern FPS with Wolfenstein 3D. There were a few FPS games before, but id popularized the genre. Rage takes places several years after an asteroid has hit the Earth and wiped out the majority of the population. Some survived the asteroid’s impact on their own, but to ensure the survival of humanity several people were selected to become part of the arc project, which put groups of people in stasis pre-asteroid strike. Unfortunately most of the arcs were damaged and very few survived, and even fewer were revived according to plan. You play a character that awakens alone in the Wasteland, with no idea what has happened following the asteroid strike, with no friends, and no clue as to what humanity has become. In the behind-the-scenes clip below, the developers discus the process of creating the world of the Wasteland and the approach to the game they hope players will take. Check out the clip below for more on the making of Rage. Rage was originally scheduled for September 13, but has been slightly delayed until October 4 when it will be released on PC, PS3 and Xbox 360.